Forrest R. Lien, LCSW, ACSW, is a clinical social worker. He has long been the clinical director of the Institute for Attachment and Child Development (IACD) in Evergreen, Colorado. 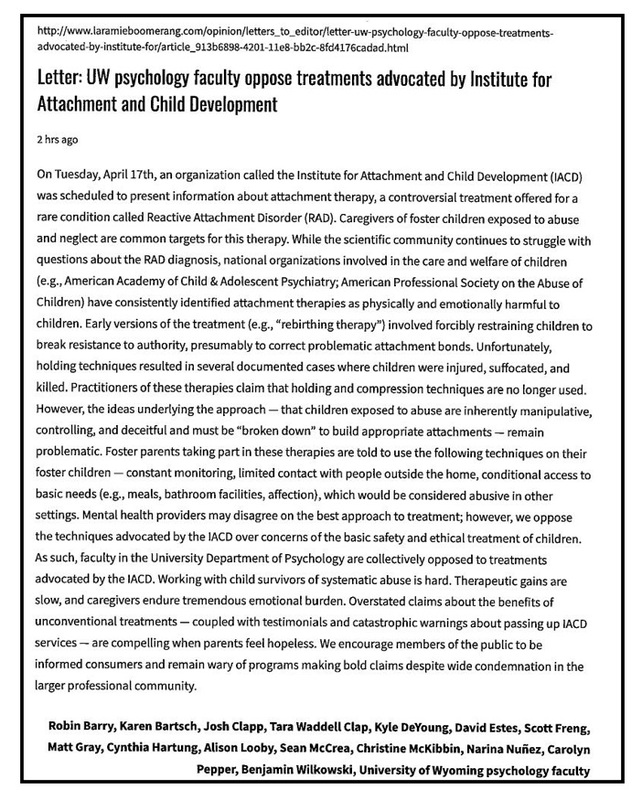 The IACD is still better known by its earlier name: the Attachment Center at Evergreen, the leader in Attachment (Holding) Therapy, founded by Foster Cline, MD. IACD has trained therapist in Attachment Therapy, rented out treatment rooms to Attachment Therapists, and offered in-home therapy. Lien also maintains a private practice in Littleton, Colorado, with Margaret Meinecke, LCSW, called FRL Counseling and Associates, which also provides training. Lien attended graduated with an MSW from University of Nebraska Graduate School of Social Work in 1983; he trained at Casey Family Program in Tucson, Arizona; and in 1995, he joined the Attachment Center at Evergreen. Lien states he was also trained in Attachment Therapy by Priscilla Misner of Esperero Counseling and by Lani Tolman of The Family Attachment Institute. Lien advertises that he is a “Certifed Provider for Advanced Brain Tecnologies” [sic]. Lien has worked with numerous well-known Attachment Therapists, including Connell Watkins and Neil Feinberg, both of whom have permanently lost their ability to legally practice in Colorado. In 2018, Lien’s speaking engagement on “RAD” at the campus of the University of Wyoming (Laramie) was cancelled, at the urging of the school’s Psychology Department (see below). In 2019, it was noted that IACD declared on its website that it would begin to use the (also unrecognized) diagnosis invented by Bessel van der Kolk called “Developmental Trauma Disorder” (DTD) instead of “RAD.” IACD reassured the public that, “We will continue to provide children and their families with the same family-based treatment model that has transformed the lives of children for nearly 40 years.” That would mean more Attachment Therapy. [I]n any kind of trauma resolution, what are we trying to accomplish? Create the ordeal of the trauma to resolve the trauma… – From "Saving Children, Saving Families, Saving Lives,” presentation by Forrest R. Lien, LCSW, Clinical Director/Therapist, The Institute for Attachment and Child Development, Birmingham, Alabama, January 14, 2005. Now the parent’s behind the one-way mirror who’s been abused and battered by these kids. You’ve got to be careful. Because if they’re sitting back there going, “Yes! Yes! You know, go after him!…Get him, therapist! Go get that kid!” …But at the same time, we want them to feel empowered. – From "Saving Children, Saving Families, Saving Lives. [A]ttachment disordered kids…they chose when they want to be irritable. In August, 1998 I attended SAMONAS (Spectral Activated Music of Optimal Natural Structure) Sound Therapy Training in Ogden, Utah sponsored by The National Academy of Child Development.... They see several kids suffering from autism, Downs Syndrome, and all kinds of developmental delays with wonderful results. The Attachment Center at Evergreen can now integrate the neurodevelopmental treatment protocols of NACD and Sound Therapy with children suffering from Attachment Disorder. It's exciting because it's cost effective and could possibly fill the neurological deficits of the kids we see. 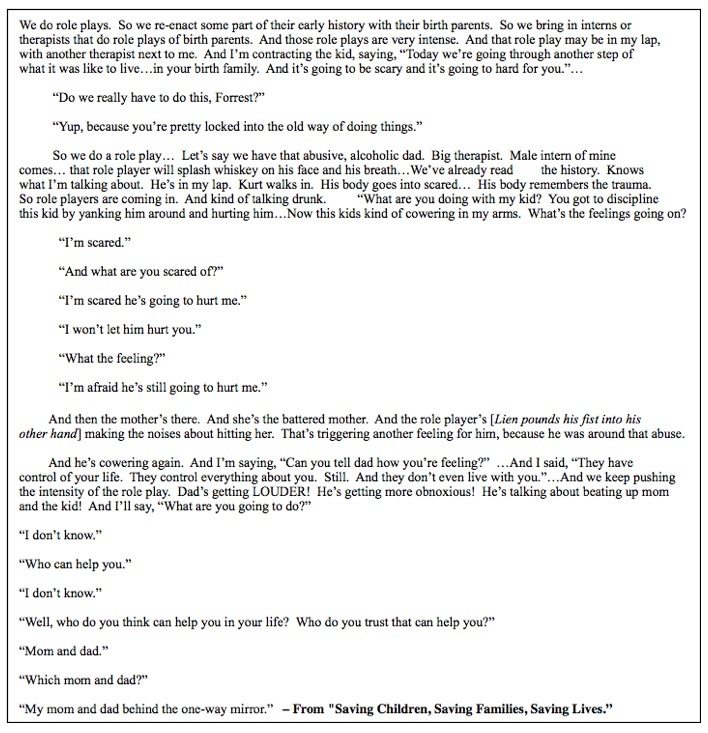 – “Samonas Sound Therapy,” by Forrest Lien, MSW, Adoption.com. [accessed 28 Dec 2011]. about twenty-six months of age.